I am catching up on TAST challenge stitches. This stitch was earlier worked TAST 2010 challenge, the link is here. The tutorial for this stitch is on Pintangle. Some variations of this stitch were tried on the earlier sampler, this sampler was started with triple chain stitch with pistil stitches. The second sample is triple chain stitch worked between zigzag coral stitches. Two rows of this stitch is the third sample. 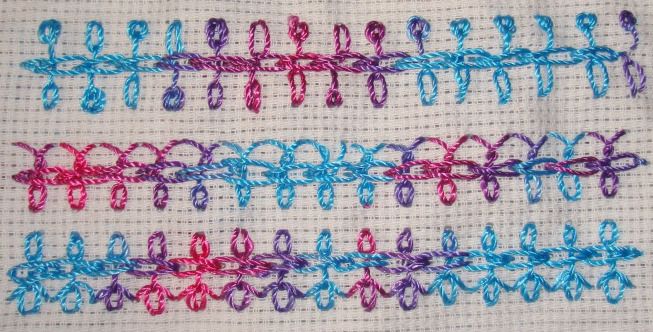 These three samples of triple chain stitches are worked with chain stitch variations. The first sample was started with berry stitch worked alternatively up and down and ended with berry stitches on top. 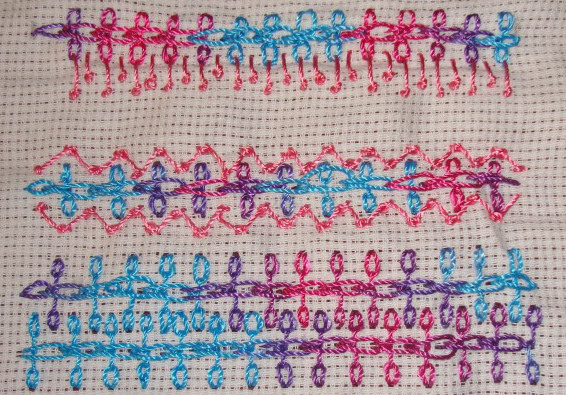 Twisted chain stitches are worked one side in the second sample. This is one example of polyester thread having a twist of its own, which gives a scalloped look. Slipped detached chains are worked on one side in the third sample. The central chain gets attention in these two samples, the central chain in the first sample is oyster stitch and in the second sample is cable chain stitch. In the first sample the central chains are worked in zigzag manner. The chain stitches are worked on one side in the second sample. Triple chain stitches are worked on feathered chain stitch variation in the first sample and worked on buttonhole stitch variation in the last sample. I liked working with this variegated thread on this stitch sampler. Some variations with beads was in mind, but thought SharonB might introduce it on next year’s challenge . Some motif ideas also floated, which were dashed with catching up wave.